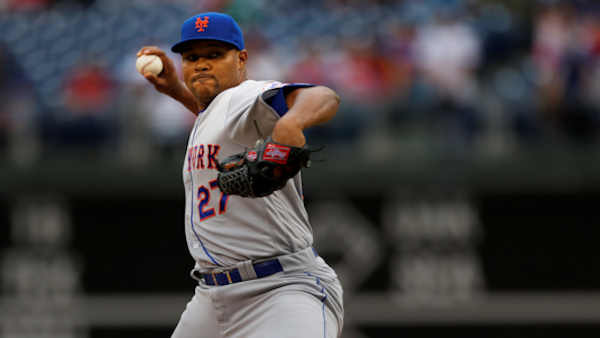 FORT LEE, New Jersey -- Mets closer Jeurys Familia was arrested on Monday in Fort Lee, New Jersey, after an alleged domestic violence incident, according to a complaint filed at the borough's municipal court. Familia allegedly caused a scratch to the chest and a bruise to the right cheek of the accuser, whose name was redacted from the official complaint. The complaint further states that officer Tony Pickens "found probable cause to believe that domestic violence had occurred." Police chief Keith Bendul told the Bergen Record that officers were called to an apartment at 2:22 a.m. ET Monday. Bail was set at $1,500, and Familia was released after his arrest, according to the newspaper. Familia and his then-fiancee, Bianca Rivas, welcomed the couple's first child in June. They reside in New Jersey. The Mets said in a statement: "The matter was brought to our attention and we are monitoring the situation." Familia was among several New York sports figures who joined a national anti-domestic violence campaign last month. The campaign, done in conjunction with the National Coalition Against Domestic Violence and the New York City Council, was part of domestic violence awareness month in October. A first-time All-Star in 2016, Familia led the majors with 51 saves. That set a franchise record and became the single-season record for a Dominican-born reliever. Familia recorded 52 straight regular-season saves from Aug. 1, 2015, through July 26 of this past season. Familia could be suspended with pay, but only if the case is deemed exceptional. He earned $4.1 million in 2016 and is eligible for arbitration in 2017. Major League Baseball recently has imposed serious penalties for domestic violence incidents. Jose Reyes received a 52-game suspension to begin the 2016 season after an incident last offseason in Hawaii involving his wife. As Reyes neared his eligibility to return, the Colorado Rockies released him and he subsequently signed with the Mets. Aroldis Chapman, whose dominant relief performance Sunday with the Cubs allowed the World Series to return to Cleveland for Game 6, received a 30-game suspension in March stemming from an October 2015 incident involving his then-girlfriend. Hector Olivera received an 82-game suspension for an incident April 13 involving a woman in Washington, D.C. He subsequently was traded away by the Braves and released by the Padres without appearing in another game.